(Nanowerk News) Wichita State University researchers are working on a new system that could decrease the negative effects of cancer drugs on patients. WSU professors Ramazan Asmatulu, Paul Wooley and Shang-You Yang – along with several graduate students – are collaborating on research that involves the use of nanotechnology in helping patients undergoing cancer treatment. 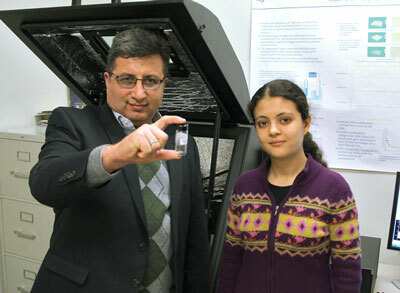 WSU professor Ramazan Asmatulu, left, with grad student Aybala Usta. Along with two other professors, the pair are working on cancer research involving the use of nanoparticles to deliver drugs to tumor sites. With that technology, the group has created nanomaterials and developed a magnetic-targeted drug delivery system with the goal of localizing as much as possible the cancer drugs to the tumor sites and therefore decreasing the negative effects of the drugs on the body. They’ve targeted their research on patients with skin and breast cancer. “Skin and breast cancer patients will be exposed with the lesser amount of cancer drugs, which have too many side effects,” Asmatulu says. So far, they have seen positive results in both “in vitro” studies (using petri dishes and test tubes) and “in vivo” studies (using mice). The group is in the final stages of receiving a patent from the study. In the future, they plan to apply the technology to humans. This nanotechnology research is being conducted in the Nanotechnology Research Lab in the Engineering Building. The lab was the first of its kind in Kansas when it was started by Asmatulu in 2006. Research in the lab includes the use of nanotechnology in other areas as well, including using nanoparticles to filter once undrinkable water, convert energy more efficiently and make lighter, stronger airplanes. Asmatulu and his team created nanocomposite, magnetic microspheres that carry protein-based chemotherapeutic drugs. Those spheres were incorporated with an albumin and biodegradable polymer that increases the accumulation of the drugs at the target site. Once the microspheres are injected with a syringe, a magnetic field is applied to attract the spheres to the tumor. Traditional chemotherapeutic drugs can wreak havoc on a patient’s body, resulting in such issues as anemia, infections, nausea and vomiting, bowel problems, hair loss and severe pain. This targeted drug delivery method created at Wichita State can make a big difference to suffering patients. “This research is vital because the side effects of the cancer drugs need to be reduced for the patients with bodies already weakened due to the disease,” Asmatulu says.